Anagram Genius is widely recognised as the world-leading software for generating anagrams, and it's not difficult to see why. Having been under development for more than fifteen years, it is now available for you to buy. There are versions available for both Windows and Macintosh, and you can place your order online now. In fact you can download it right away and start producing anagrams in just a few minutes. Whether you are serious about making anagrams, or you just want to enjoy discovering and sharing the hidden meanings in the names of your friends, colleagues, and competitors, we recommend this highly as the best software available. Through Anagram Genius's user-friendly interface you have complete control over the types of anagrams which are produced. To find out more about features of Anagram Genius, and see some screenshots, click here. Anagram Genius has received much praise from the major magazines and newspapers that have reviewed it. Reviewers have described the software as "tremendous fun", "delightful" and "amazing". And Computer Shopper Magazine had this to say: "It's always a pleasure to come across a well-coded program that reeks of having been written with a passion for the subject or task in hand. Anagram Genius is one such program... spend an evening with this package and you'll not only have fun, you could end up hooked." Find out how to order Anagram Genius. Click here for more details about the features of Anagram Genius. To find out about Anagram Genius - The Book, read on. Following the very successful launch of Anagram Genius, a spin-off book of anagrams was published, compiling the best submissions from Anagram Genius users. 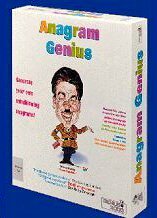 You will see what a powerful anagramming tool the Anagram Genius software is from this book packed with perfect and hilarious anagrams, all produced using this software. To order a copy you can use the same online order form as for purchasing the software. Highly recommended by Fun-with-words.com. Try anagramming your name for free!